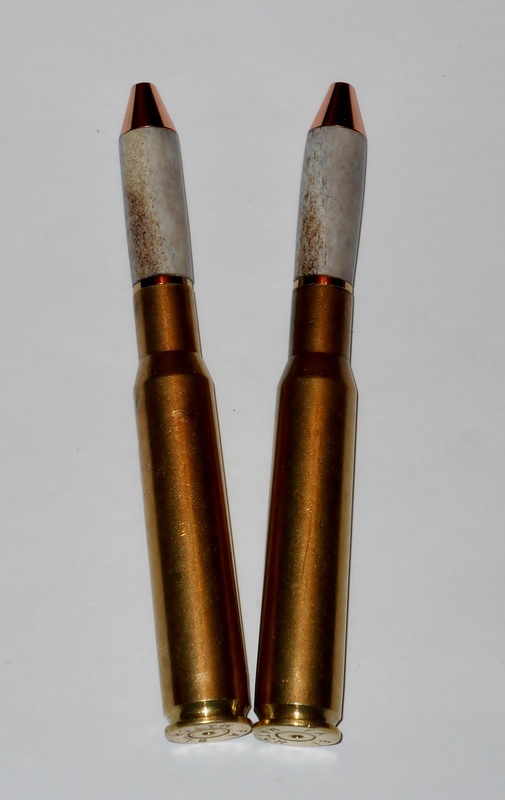 Real bullet pens are available in brass only, except the .30-06 which is also available in nickel plated. Real bullet pens are available in other calibers by special order. Except for snakeskin pens, most materials shown can be combined with the caliber or finish preferred in a few days time. Real Wyoming prairie rattlesnake skin cast in clear resin atop a real bullet .30-06 caliber - brass with gold trim. This pen uses an authentic .30-06 caliber once-fired brass cartridge with its natural patina. 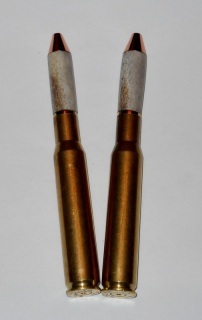 This popular caliber deer hunting cartridge is paired with a turned antler projectile to make a smaller pen along the same lines as the massive .50 caliber. This pen is 3 3/4" long and takes a standard mini refill. It has no clip for a pocket. 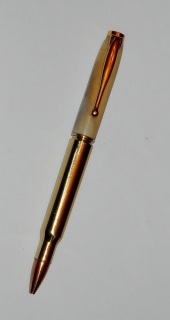 A 5.56 NATO "Genuine bullet" pen with a top made from elk antler. Hand turned and polished white tail deer antler atop a real bullet .30-06 caliber - brass with gold trim. No, not a missile, but a pen for the veteran or military enthusiast. First developed for the Browning, a .50 caliber machine gun in the late 1910's, the cartridge used in this pen is commonly used in the military. This pen uses an authentic .50 caliber once-fired brass cartridge with its natural patina with desert camo projectile and takes a Cross style refill. This is a large heavy pen, and has no clip for a pocket.